The 5 Skinny Habits is based on wisdom from some of history’s great healers and scholars. David Zulberg discovered that ancient physicians already knew what modern science is now rediscovering about health, weight loss and disease prevention. In this book he attempts to bring awareness to this traditional knowledge about health. He provides readers with a practical five-step plan for utilizing these principles in our modern lives. This program integrates the spiritual, emotional, and physical components of health and weight loss. It focuses on developing healthy lifestyle habits and learning how to continue applying them over the long term. The concept is that you change one habit a week for a total of five weeks. This allows you to gradually create new beneficial eating and fitness patterns for healthy weight loss. It is important not to jump stages in the program. You should introduce only one new positive habit each week and keep the rest of your routine exactly the same. In week one you will make just one change. In the second week you keep going with your first healthy habit and add an extra one – and so on. In addition to a light breakfast you now change either your lunch or dinner. Instead of your usual meal you should consume only protein and vegetables. You can also have a glass of red wine with your meal. V is for veggies. The third change is to make your remaining meal each day a V-Plus Meal. Eat your normal meal of protein and complex carbs but if you want seconds you can only eat vegetables. To get started with exercise you can perform 10 minutes of cardio activity, 3 times a week. In week six you will increase this up to 20 minutes, 5 times a week and add strength training, 3 times a week. Ball games are especially recommended because they sharpen your mental faculties. However the most important thing is to do whatever fitness activity you enjoy the most. Exercise reduces body fat, prevents disease and alleviates stress. In the final week you focus on replacing your usual snacks with more healthful choices. Recommendations include vegetables, fruit, and low-fat dairy products. Beef, lamb, veal, chicken, turkey, eggs, fish, milk, cheese, yogurt, tempeh, tofu, peanuts, pistachios, almonds, black beans, chickpeas, whole wheat bread, rice, popcorn, sweet potato, asparagus, lettuce, spinach, zucchini, tomato, beets, apples, berries, olive oil, canola oil. 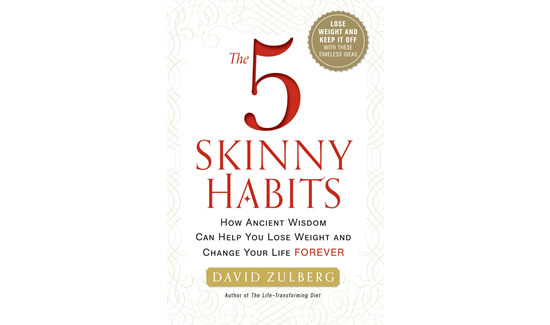 The 5 Skinny Habits: How Ancient Wisdom Can Help You Lose Weight and Change Your Life FOREVER retails at $24.99. Enhances awareness about habit formation and provides a structured method for integrating the principles. Allows you to gradually make adjustments in your lifestyle at a suitable and effective pace. Readers are encouraged to keep a diet diary, which promotes self-monitoring and increases the likelihood of successful weight loss. Based on traditional principles of health in combination with modern science and nutrition. Weight loss may occur slowly, especially in the beginning. Necessary to monitor the calorie intake of some of your meals as you progress through the program. The 5 Skinny Habits is a weight loss program that helps you make gradual adjustments in your daily routines. This five-week plan shows you how to change just one habit a week. By the end you will integrate all of these changes to create a healthy lifestyle that supports long-term weight management.